At its first meeting last month, the members of the citizen committee working on the Oconee County comprehensive plan update asked for more opportunity to speak, and they were given a bit of a chance to do that last (Tuesday) night. 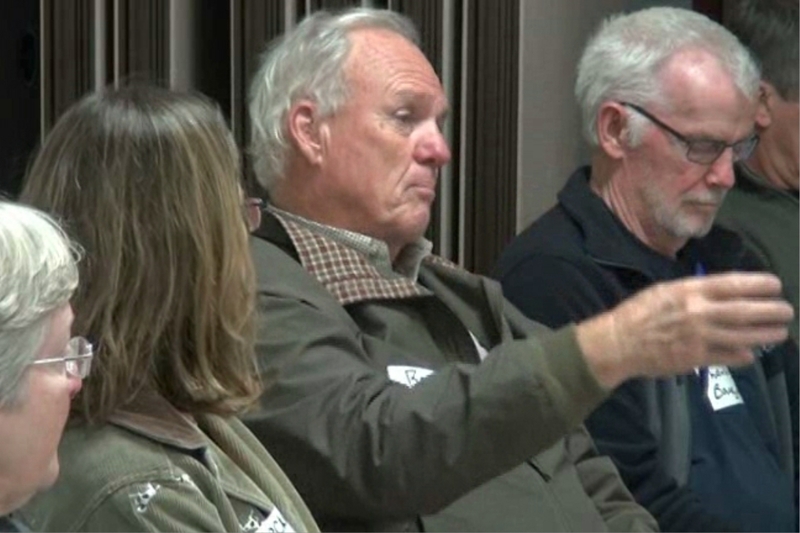 The discussion revealed significant differences within the group, with some arguing for development throughout the county, including in the largely rural south. Others said the county needs to identify areas where it wants growth–and limit development to those areas. Justin Crighton from the Northeast Georgia Regional Commission, hired by the county to lead the comprehensive plan update, used most of the 90-minute-long meeting to provide information to the citizen committee. He promised once again to have a more open discussion when the group meets again on April 11. Committee member Bob Bishop told the group he was unhappy with the current restrictions on development. “I have land in the south of the county, and I can’t develop it,” he said. “But the people in the north end of the county can. Bishop, who also owns and has developed land just north of Watkinsville at Bishop Farms Parkway, said development should be allowed throughout the county, not just in the north. Brian Brodrick, a Watkinsville city council member and the Watkinsville representative on the citizen committee, disagreed. “I think it is really rare to see somebody handle it (development) throughout the entire county and not have the entire county look like an absolute disaster,” he said. The Board of Commissioners appointed the 24-member Stakeholders Committee from the 33 people who applied. Each of the county’s four cities also appointed a representative, as did the Board of Education. Crighton is now calling the group the Comprehensive Plan Steering Committee, though the county is still using the term Stakeholders Committee. The group includes individuals who have been outspoken in support of preservation of the rural nature of at least the southern part of the county as well as representatives of the development community. One of the most important assignments of the Steering Committee is development of a land use map, which will specify where the citizens, and ultimately where the county, want various kinds of development. B.R. White, director of the Oconee County Planning Department, told the citizens that he and his staff use the map in dealing with zoning requests in the county. Oconee County Board of Commissioners Chairman John Daniell said the Steering Committee could consider putting even “more teeth” into the character areas shown on the map to further guide zoning in the future. Commissioner Chuck Horton said he uses the land use map in evaluating zoning requests that he votes on as a commissioner. At the meeting on Feb. 14, Crighton said that the beginning of the meeting last night would be used to tell the public about the procedures to be followed in updating the Comprehensive Plan and land use map. No notices were made to the public, however, and Crighton proposed last night to update the public on the procedures at the next meeting on April 11. Crighton said he was merely “checking off a box” in holding that session with the public, and that the public wouldn’t be given a chance to speak until later in the process. With the agreement of Commission Chair Daniell, Crighton agreed to hold the session in which he informs the public of the procedures at the April 4 Board of Commissioners meeting. Crighton also asked Steering Committee members to circulate a survey he created to solicit citizen input. He acknowledged that citizens can complete the survey as often as they like. Even without public notice, 11 citizens not on the appointed Steering Committee showed up last night’s meeting. Twenty of the 29 members of the Steering Committee were in attendance. Planning Director White was joined by Andrew Stern, a planner on White’s staff. County Clerk Kathy Hayes is taking minutes of the meetings. At the suggesting of the Steering Committee, Crighton agreed to add a new module to the Comprehensive Plan dealing with Parks, Recreation and Green Space. He also passed around a sheet asking those interested to join four different committees. Those committees are to deal with Transportation, Land Use, Public Information, and Parks/Recreation/Green Space. Crighton said that, at the next meeting on April 11, the subcommittees would meet and begin deliberations on the four selected topic areas. The complete video of the meeting last night is below. The Steering Committee was meeting in a circle, and the rear of the room was poorly illuminated. The meeting was at the Community Center in Veterans Park. Sound was not amplified for any of the speakers. OCO: Comprehensive Plan 3 14 17 Complete from Lee Becker on Vimeo. I have created a Channel on Vimeo Called Comprehensive Plan 2018 that contains this and other relevant videos and will add to it as the process goes forward. The developers dont give a damn about anyone but themselves. They want to develop the entire county as fast as they can. They dont care how it effects you or anyone else since they dont live in their own developments. To Mr. Justin Crighton of the Northeast Georgia Regional Commission: Thanks for just "checking off a box". That's dismissive and condescending to the 38,000 residents of Oconee. I hope you take this process more seriously and responsibly from this point forward. Could not disagree with Mr. Bishop more. The county has a long and rich agricultural history. Without a smart plan, we will be doomed to be a version of Gwinnett, which has no character, no center, no sense of community, just strip mall hell. The county has come to its crossroad. While it is crucial all voices should be heard, not all will dictate terms. Of course a builder will want to develop out the county. Of course everyone wants Bambi leaping merrily in the back yard. Owners of property meaning to take profits collide with wishes for aesthetics. The most import issue facing the future of our county in the making of decisions. It's interesting to me that we all vacation to places of great natural, urban or architectural beauty because those places make us feel good, yet there are people who don't see the value of preserving or creating that same beauty at home. When Mr. Bishop goes on vacation, I doubt very much that he goes to the suburbs of Atlanta or some other suburban nightmare, yet (he does not see) the value of making Oconee County a place where people want to live and visit. there won't be farms left in the county unless an area is zoned for them to be; you cannot have a working farm next to development; the farm cannot continue to exist. This is an important process. It will determine whether the agricultural nature of the south part of the county continues or is destroyed forever. People do need food to eat and it has to be produced somewhere, closer to where people live is healthier. Here's a major problem here in Oconee: Much of the farmland and land for raising cows, zoned agricultural, is owned by longtime older residents. Farming is tough, hard work with uneven financial reward. I know some of these families. Their children and grandchildren simply don't want to continue to farm or raise cattle. It's easy to sell land that's been zoned agricultural to a subdivision...or solar farm...or an auto dealership. Melvin Davis had no problem with that, no matter what the consequences, no adhering to a long term growth plan. The county's Economic Development Director has consistently gone after the "low hanging" fruit, instead of taking advantage of the county's proximity to UGA, and the research, bio tech, medical, tech, type development Oconee should have, instead of another subdivision and corporate fast food eatery. Yeah, we're getting a Bojangles across from the entrances to Oconee Elem and Oconee Primary. The county's Planing Director has enabled rezone after rezone after rezone. Various conflicts of interest don't help either. County commissioners have been complicit by allowing rezone after rezone. Unless there is a groundswell against wily nily development, unless our commissioners look at transfer of development rights, which benefit the landowner and the county as a whole, Oconee County will be quickly become Gwinnett Lite, souless, ugly, indistinguishable from any other suburban county. Your county leaders are selling Oconee county down the river.... and wont be here to suffer the consequenses. When you hear Smart Growth words and they hand out slick brochures, BEWARE! This is a scheme we fought off vigorously in Newton county ... And WON! Hay, they even have a slippery slick scheme for forcing you into long term land use, Your land... you Wont like it and they work hard at calling you bumpkins and that you are not smart enough to realize its all for your own good... yeah... not so much. Yall better get your selves to this meeting and i mean IN VOLUME. One ither thing... look up Agenda 21 and get an overview so you will recognize what they are pushing. It aint good folks. Its all about getting into your pocket and controlling your land use. Doesnt even smell like Freedom.